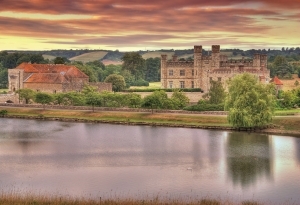 Leeds Castle is situated in Kent in south-eastern England, one hour’s drive away from London and 5 miles to the southeast of Maidstone. It is a very picturesque castle, with almost fairytale-like qualities. Being situated on two tiny adjacent islands on the River Len and surrounded by a wide moat, it is set in 500 acres of beautiful parkland and formal gardens. The larger of the two islands is connected to the smaller one with a stone crenulated bridge. Leeds Castle is famous for having belonged to six different Queens of England during Medieval times, as well as for having started out as a Norman stronghold. 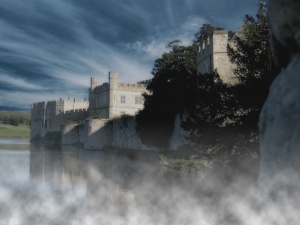 A wooden fort rumoured of having belonged to the Saxons stood on the site of Leeds Castle as early as 857AC, however the first stone castle was built by a Norman baron, Robert Crèvecoeur in 1119, during the reign of William the Conqueror’s son, King Henry I. The first stone fortifications, where the castle stands today, were built on two rocky outcrops in the middle of the river Len. The main fortification, that is the Keep, was built on the smaller of the two islands, while the domestic buildings were built within the larger island. The two islands were connected by a drawbridge over a ditch filled with water. The Crèvecoeur family lost the castle briefly in 1139 when it was besieged and taken by Stephen of Blois, when he ascended the throne in place of Henry I’s daughter, however then it regained control of it once more. The Castle and its surrounds offer a huge number of different attractions – creating a full day of experiences for the whole family. The grounds themselves offer not only lavish-styled walks and views, but a carefully-tended number of wildlife, waterfowl and other kinds of fauna. There are a large number of gardens, each with its own unique style – one could mention for example the Culpeper Garden which features an informal cottage-style layout typical of the English 17th century style, overflowing with roses, lupins, poppies and lad’s love. Another pretty trove is the Wood garden, alongside the River Len, as well as the Lady Baillie’s Mediterranean Garden Terrace, which offers a superb view and is a favourite destination for visitors. One of the most famous attractions at Leeds Castle is the garden maze, which was opened in 1988 and which consists of 2,400 yew trees. The maze is set in a square, and yet its pattern is circular. Those who solve it, are rewarded with a beautiful exit tunnelling its way from an underground grotto, complete with macabre forms and mythical creatures created from shells and wood. There are also two playgrounds – one for children under 5 years of age, and another for children over that age. The under 5 one has a pretend castle to climb on, as well as a number of slides and a sand pit, while the over 5’s park has even taller slides. Children might also be interested in the Dog Collar Museum, which offers a collection of historical dog collars, or be riveted while looking at the free daily falconry displays which take place in an area in front of the maze. There is also a Bird of Prey Centre, which organises various activities, and which houses over 22 birds, and 16 different species. 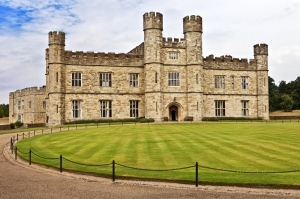 Leeds Castle has its own parking, as well as having a restaurant, coffee shop, and quite a large souvenir shop. It also offers a number of rooms and halls for the hosting of weddings and other occasions, as well as having a number of self-catering cottages and bedrooms available for visitors. There is also quite a large golf course around the parkland surrounding the Castle itself. The golf course is open nearly every day of the year, having a nine hole par 34, and measuring 2,843 yards. There are also changing rooms with shower facilities. All tickets grant repeat visits for a whole year from the date of issue, you can use your ticket to visit as many times as you like.